Are you looking for an air conditioned way to entertain your child this summer? Or a heated way to keep them busy this winter? Then LEGOLAND® could be for you. 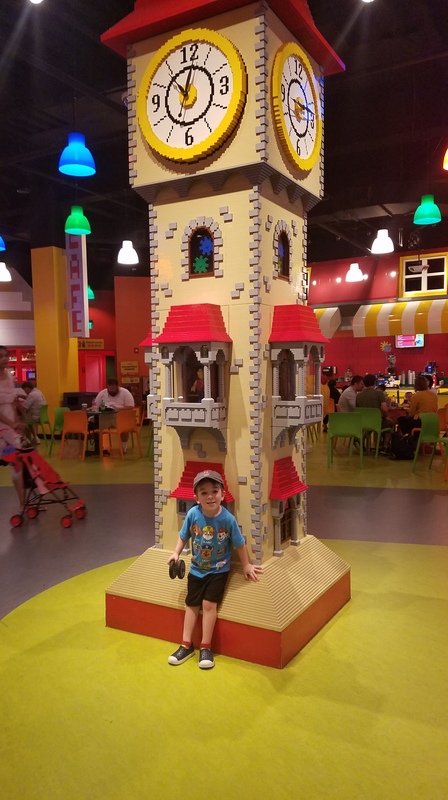 LEGOLAND® is located at 598 Assembly Row, Somerville, MA. There is a giant lego giraffe outside. You can’t miss it. Free parking is located in the parking garage at 100 Foley Street, Somerville, MA. We arrived around 10:30 am on a Sunday morning. There was no line and inside it was crowded, but not unbearably so. I was surprised because I had heard stories about lines out the door at LEGOLAND®. The woman at the ticket counter did not smile and did not give us a map. Tickets are $23.00 per person, there is no discount for children or adults, unless the child is under 2, in which case they are free. I had a coupon for 1 free adult ticket with the purchase of any children’s ticket. I would go there again with the coupon in a heart beat. Without the coupon, I won’t be going again until my kiddo is a few years older and can enjoy it a little more. When you first enter there will be a photo opportunity and you can purchase that picture later if you like. Then you are herded into an elevator that spits you out into a room where a short introductory/instructional movie is playing. You will try to pay attention to it, but to no avail because your child, and all the children around you, will be itching to run through the doors. Alas, the doors don’t open until the video ends. Once through the doors, you will find yourself in a room where you can virtually guide factory workers through creating a lego. My toddler couldn’t reach the controls in the Lego Factory Tour room, so we skipped this station. But I did find a map on the floor of this room that was quite helpful. Next up is the Kingdom Quest Ride, where you will sit with your kiddo and shoot at spiders, ghosts, and other evil creatures. I’m not sure how the game ends because the last screen on our quest was broken. My toddler had fun on this ride even though he wasn’t strong enough to pull the trigger. 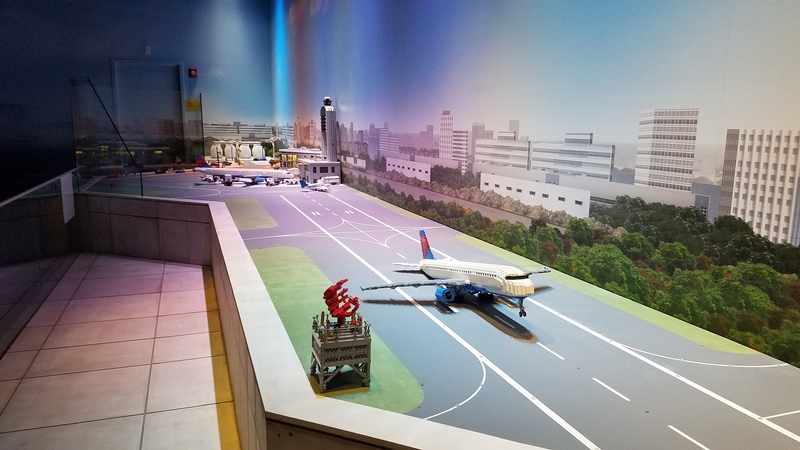 After completing the quest, you’ll find yourself in Miniland, where you’ll get to see all of Boston’s hottest attractions in mini lego form. This room is actually pretty cool because the mechanics work. You can fire up the Citgo sign by Fenway Park, watch the football game at Gilette Stadium, drive a luggage cart at Logan airport, have a real mini crew race on a tiny and less polluted Charles River, and more. We visited this room 3 times and noticed something new each time. The Merlin’s Apprentice Ride is fun for all ages, so long as an adult doesn’t mind going on it with the kiddo. My toddler’s legs were far too short to reach the bike pedals. The faster you pedal, the higher you go, so if your little one gets scared of heights, you can control how low or high you end up. 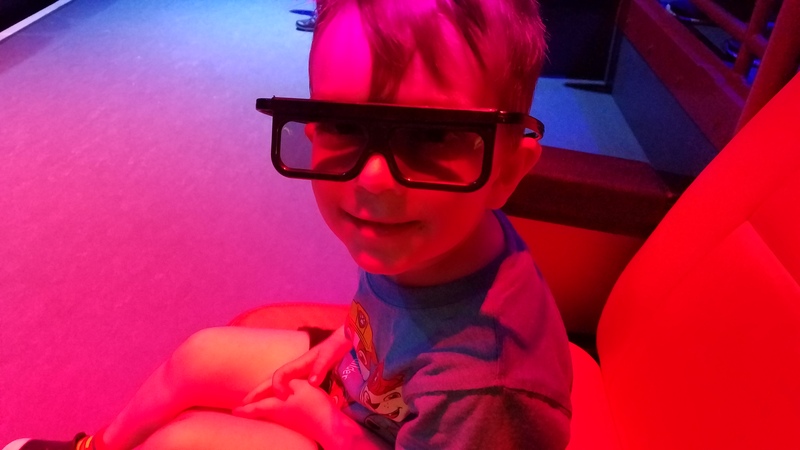 I tried to get my kiddo to watch the movie playing at the Lego 4D Cinema, but he refused to sit still even for a few minutes while waiting for it to start and he didn’t like having to wear the 4D glasses. He asked to leave about a minute into it and I obliged. I was grateful later when I saw people coming out of the theater soaking wet. It really rains and snows on you in there! Make this your last stop, or bring a change of clothes with you. He stayed in the 4D movie long enough for this photo and that was about it! 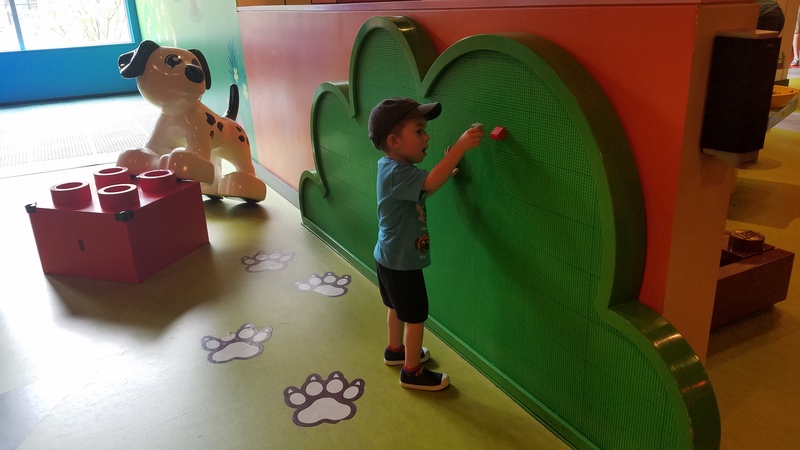 We thought the Lego City Builder room would be tons of fun, but all of the fun cars were glued down (the Kragle strikes again!) and there were so many kids at the table it was hard to find a spot or to find any legos. Luckily, the Lego Racers: Build and Test area kept him entertained for almost a whole hour. 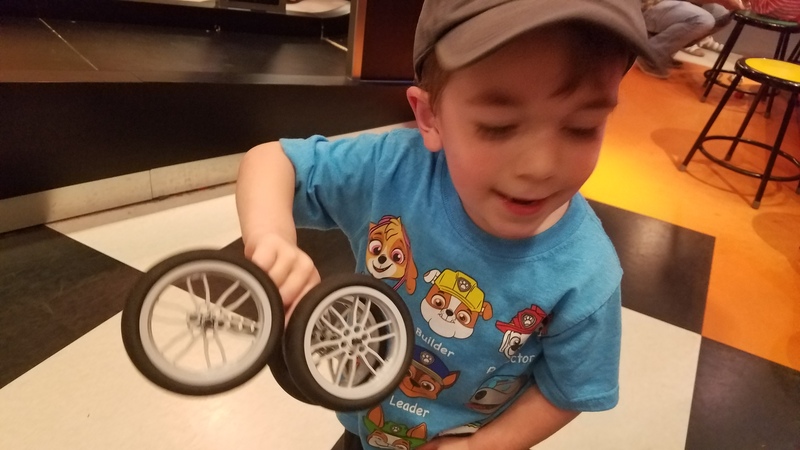 Kids get to build cars and test them for speed and durability. OK, who are we kidding? In reality, frustrated children force their parents to build cars and let their kids test them for speed and durability. But be prepared – this area seemed short on wheels so you may have to wait a while to play. Parents and kids alike seemed to love the Lego City Play Zone. It is reminiscent of the McDonald’s indoor play areas and only children are allowed in. This seems like a great idea until you want to get your kid out of there for one reason or another and realize that you’re going to have to use logic, threats, or bribery to get them to come out of the play area of their own volition. We found the Duplo Farm to be pretty boring since you aren’t allowed to climb on the giant animal displays and the only other entertainment in that corner is a slide and some Duplo blocks. The same goes for the Lego Friends area, which has a karaoke machine in it that no one uses and not much else. Slightly older children were sitting at the Earthquake Tables building some pretty intense and detailed towers. My kid was the one who ran around in a circle and hit all the earthquake buttons next to these poor, unsuspecting souls, causing their hard work to crumble before their eyes. Tears ensued. I went into embarrassed mom mode and apologized profusely, but to no avail, so I just gave up and we walked away. The website advertises a Lego Master Builder Academy, but this was closed when we were there. However, you can watch a Master Builder build some stuff through a window near where you purchase the photo that they took of you when you first came in. Let’s talk about the Café, which claims to have healthy options. Sure, they have a few small containers of carrots, guacamole, or celery, but if you want an actual meal then you are out of luck. They did have pre-packaged salads there, but each one of them contained something that I couldn’t eat. Of course, I’m a pretty high maintenance eater since I don’t eat gluten and I try to stay away from dairy. Most of their food is highly processed junk. You have no choice but to go through the Lego Store on your way out, so be prepared to buy your kiddo something, lest he scream all the way home. If you don’t have a coupon, you can purchase tickets at a reduced price on the LEGOLAND® website. A reader of this blog let me know that you are not allowed to bring your own food, even though there is no signage indicating this anywhere on the premises. Just FYI: You are NOT allowed to bring your own food into Legoland. I learned this yesterday when I brought lunch from home and tried to eat it there. A staff member informed me that they have a no outside food rule although there is absolutely no signage at the attraction. After looking through their website, the FAQs page is the only place they mention you can’t bring your own food. Whoa, thanks for the info Tabatha! I had some snacks in the diaper bag that we ate there, but they must have just not noticed. 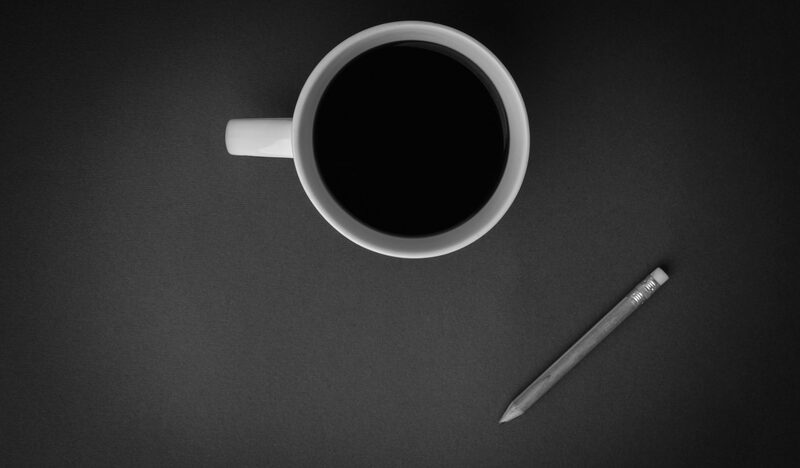 I have updated the blog post to reflect this.